The Rain Cometh - Hi, friend Climate and Weather Information, in this article entitled The Rain Cometh, we have prepared this article well and concise to be easy to understand for you to read and can be taken inside information. hopefully the contents of the post that we write this you can understand and useful. okay, happy reading. Today was as close to perfect as weather can get around here. In Seattle: no clouds, high in the mid-70s, nice breeze. The air was clean and visibility was excellent. But this will be a weekend with a different ending and the change is moving in right now. Here is the latest radar image from the NWS Camano Is. radar. You see all those greens and yellows in the upper left-hand portion of the image...that is moderate rain associated with a well-defined frontal band that is now moving into western Washington. 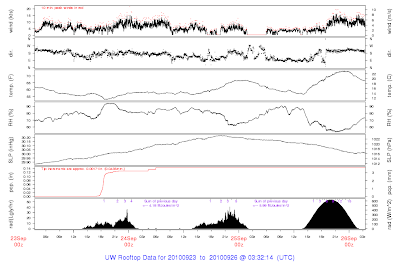 The echos over the Puget Sound region are probably birds. The frontal band that is moving in is quite clear in the latest infrared satellite image (see below). You will also note there isn't much immediately behind it...a different story from our normal wintertime frontal passages, which are followed by cold air showers. One amazing thing about today were the clear skies....I mean NO clouds at all and great transparency to the atmosphere. You want to see the proof? 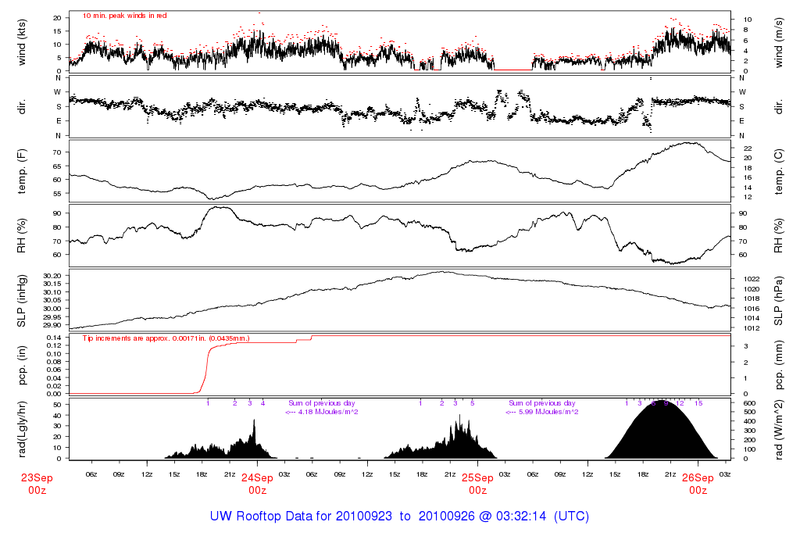 Below are the observations taken on the roof of my building at the UW for the past 72 h (click to expand). The lowest panel shows solar radiation. Thursday and Friday the amount of solar radiation was greatly lessened by clouds....but look at today. Amazing. Almost a perfect sinusoidal shape--could have been from a textbook. OK, time to stop raving about today. The front is moving in quickly and rain should hit the interior lowlands overnight and spread over the Cascades in the morning. Here is the forecast 24-h rainfall ending 5 PM tomorrow. Fairly heavy rain (up to 2.5 inches) for the western side of the Olympics, the mountains of Vancouver Is and the north Cascades. The WA coast will be wet. And a general decline to the south and east. Head to the Tri-cities and Hood River if you want to stay completely dry. The front will weaken as it makes landfall. Many of us are hoping for lots of rain from this event. The all-time wettest Sept for Sea Tac is 5.95 inches and we have nearly 4.4 inches now...a big hit tomorrow could make up half the gap! But we don't have much time. On Wednesday night there will be a meeting of the Puget Sound Chapter of the American Meteorological Society here in Seattle (see info to the right). This gathering is open to all and it will be a great opportunity to hear the latest on the upcoming winter from a national expert from the National Climatic Center. On Saturday, Oct 2, I will be doing two events---that night I will be giving a lecture in Bellingham at 7 PM on the extreme weather of NW Washington...and believe me they have a lot to brag about (see info to the right). That morning I will be doing a book event (e.g., signing books and talking to people) at the south Seattle Costco from 9:30-11:30 AM (http://www.washington.edu/uwpress/calendar/cal_event.php?id=265). Other UW Press authors will be there as well. Thank You and Good article The Rain Cometh this time, hopefully can benefit for you all. see you in other article postings.